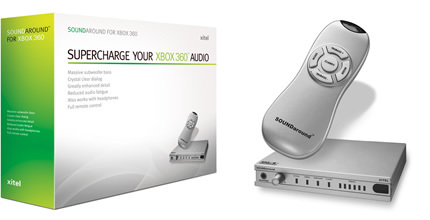 Plug in, play and enjoy better audio performance with USB convenience. 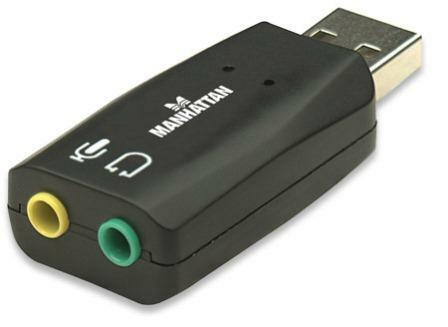 Ideal for desktop, notebook and netbook computers, the Manhattan Hi-Speed USB 3D 7.1 Sound Adapter instantly creates microphone-in and audio-out ports through any USB port. Easily connect headsets, microphones and speakers equipped with 3.5mm cables that are too short to comfortably reach ports in awkward or inconvenient locations. With plug-and-play and hot-swap capabilities, it easily replaces inoperative sound cards, bypasses damaged audio ports and improves access without special drivers or software. A built-in class B power amplifier utilizes USB bus power, eliminating the need for external energy supplies or additional cables. Support for 3-D audio and virtual 7.1 surround sound and built-in sound effects with a 10-band equalizer deliver rich, high-quality experiences with familiar USB convenience and functionality. 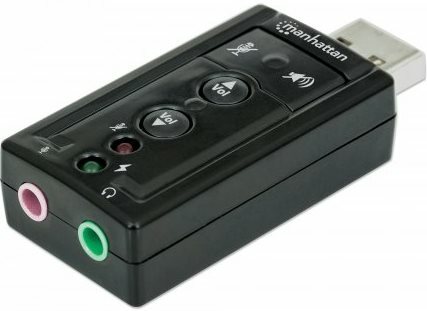 The Manhattan Hi-Speed USB 3D Sound Adapter instantly creates microphone-in and audio-out ports through any USB port. Easily connect headsets, microphones and speakers equipped with 3.5 mm cables that are too short to comfortably reach ports with awkward or inconvenient locations. With Plug and Play and hot-swap capabilities, it easily replaces inoperative sound cards, bypasses damaged audio ports and improves access without special drivers or software. A built-in Class-B power amplifier utilizes USB bus power, eliminating the need for external energy supplies or additional cables. Support for 3-dimensional audio and virtual 5.1 surround sound and built-in sound effects with a 10-band equalizer deliver rich, high-quality experiences with familiar USB convenience and functionality.